Black Rat Projects annual print show opens this evening in London 10 February. 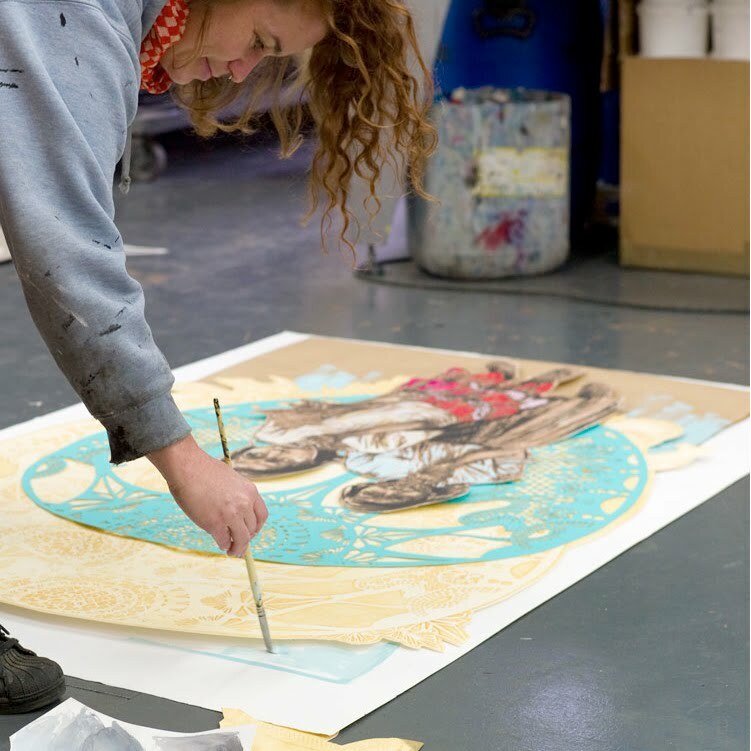 Print Making Today will see them releasing new editions by Matt Small, Candice Tripp, Gaston Francsico and what has been their most technically complex printmaking project with Swoon to date. These works will be displayed alongside earlier BRP projects as they contextualise their archive with some of the most important artefacts of contemporary printmaking. Works by Bridget Riley, Lucien Freud, Damien Hirst, Chris Ofili and Grayson Perry will be among those on display. In celebration of the print process the opening night will see an inclusive insight into the fundamentals of printmaking as Stoke Newington’s local printmakers the Henningham Family Press set up their ‘Chip Shop’ for what will be a performative addition to the exhibition. Running parallel to the print show is the BRP pop-up Project Space which sees ROA back in town and the first artist in this residency project, which aims to lends support to artist for a flexible period of time with the view to breeding experimentation and facilitating a freedom of expression un-connected to commercial gain. The Belgian artist has been working on a site-specific sculptural piece incorporating doors, windows and un-expected openings which break through the contained frame of the Project Space built in the centre of the gallery. The preview evening is tonight 10 Febrauary 2011, 6 — 9pm and from what we have heard looks set to be a great evening. Can any one tell me when this show runs untill?